What is a Nil Return and when should you file one? A nil income tax return is filed to show the Income Tax Department that you fall below the taxable income and therefore did not pay taxes during the year. 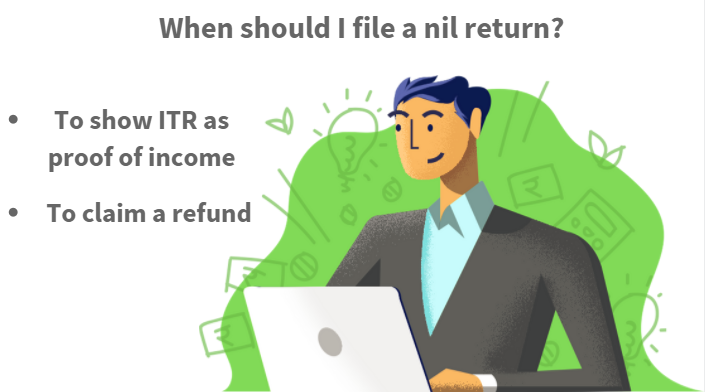 When should I file a nil return? You are just starting out and your total income falls below the taxable limit, but would like to keep a record. There are several instances where income tax serves as a proof, say when you are applying for visa or while getting your passport made. You were filing your income tax returns for many years and fell into the ‘below taxable limit’ this year. This is to continue maintaining a record and also preventative measure in the event of a scrutiny from the Income Tax Department. Your total income without taking deductions into account could be above the taxable limit, but with deductions might be below the minimum exemption limit of Rs.2,50,000. If you paid more in taxes than you needed to, you must file an income tax return to claim a refund. Can I go without filing a nil return? Filing income tax returns is mandatory for those whose total income is more than Rs.2,50,000. We recommend that you file your income tax return, even though it is not mandatory if total income isn’t over Rs.2,50,000. How do I fill up a nil return online? Filing a nil return is no different from filing a regular income tax return. Enter your income details and deductions. Income tax is computed and you will be shown that you have no tax due. Submit your return to the Income Tax Department. And send your ITR-V to CPC Bangalore to complete the e-filing process. Click here to read our guide to e-filing. I did not file my income tax returns for the last 3 years. I have applied for visa now and have been asked to furnish my income tax return. What do I do? The Income Tax Department accepts tax returns online for only up to the last Assessment Year. You can now file your income tax return for AY 2015-16 and AY 2014-15. For years prior to AY 2014-15, you must compute the tax liability, pay any pending taxes for that year and give a written submission to the Assessing Officer in your ward.